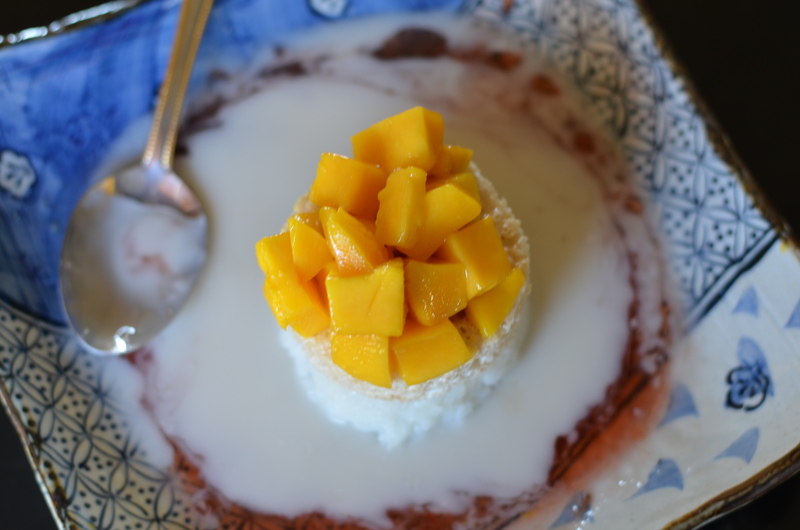 In Dallas, there’s a modern Thai-Vietnamese restaurant called Malai Kitchen that has one of my—and my family’s—absolute favorite desserts: mango sticky rice. It’s to die for! I don’t even need to eat there for a meal… all I need is dessert! 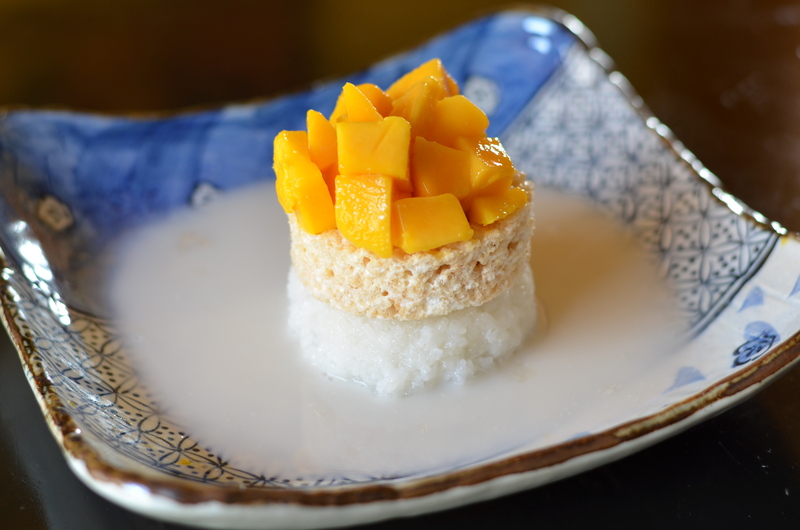 This modern mango sticky rice has four basic parts: sticky rice, crisped rice treat, mango, and sweet coconut custard. I think part of the reason I love this dessert so much is because of the mangoes. I love the vibrant, orange hue of mangoes in the Philippines. Whenever I see those nice colors, I always have flashbacks to the summers I’d spend in Manila as a young child, eating diced mangoes in the kitchen of my grandparents’ condo. 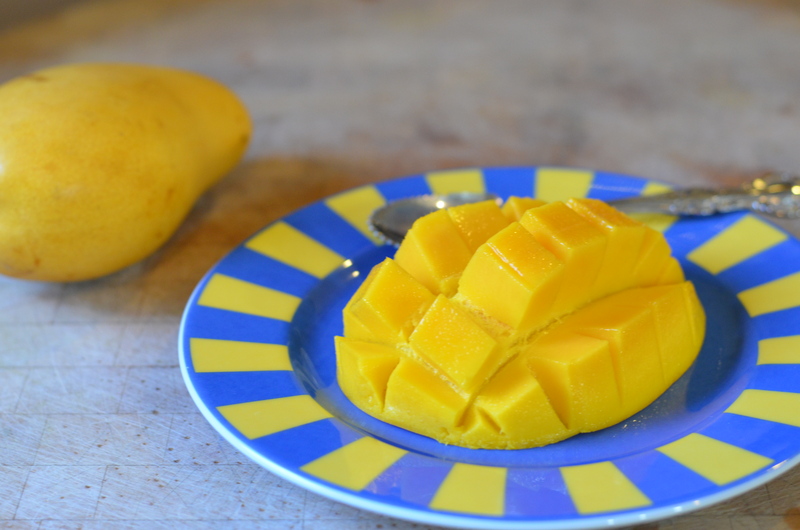 The sweet, succulent taste of mangoes goes well in nearly everything, dessert included. 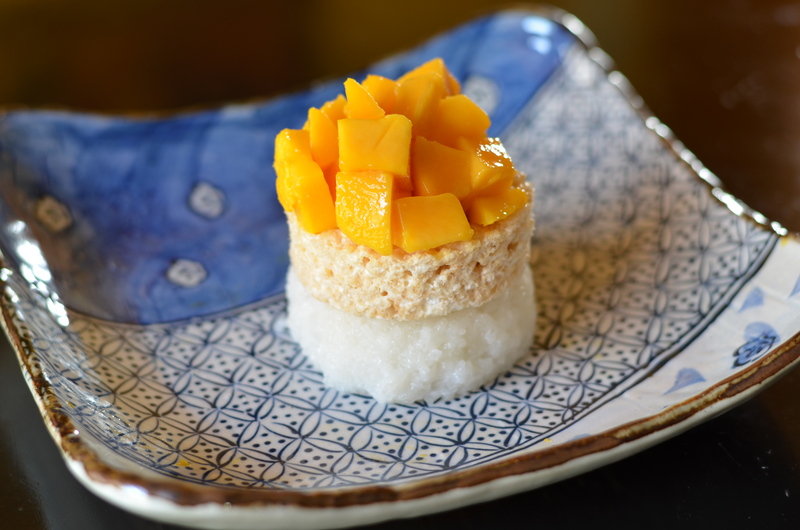 And while authentic Thai mango sticky rice doesn’t have the crisped rice, I still feel like it’s a fun, Western addition to an Eastern food. 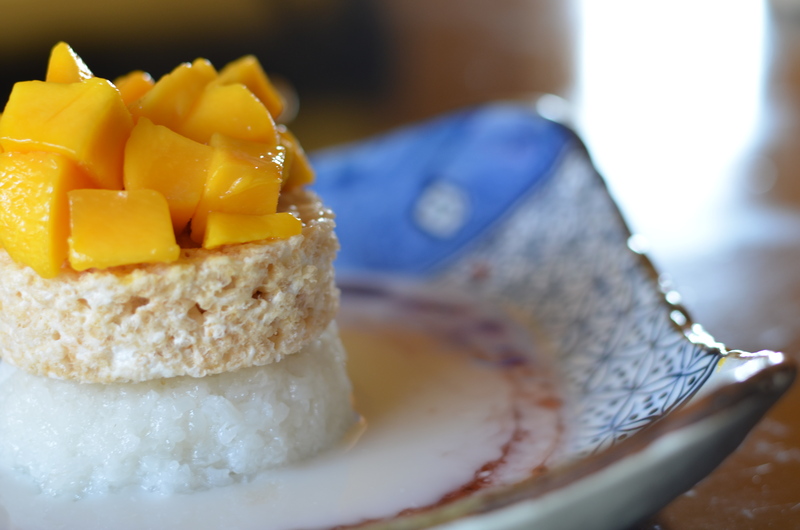 The best way to eat this is to just take your spoon and cut off a part of the side, making sure to get all four parts: rice, crisped rice, mango, and custard. It’s a perfect afternoon pick-me-up, as well as great for guests. Because let’s be serious… who doesn’t love dessert? 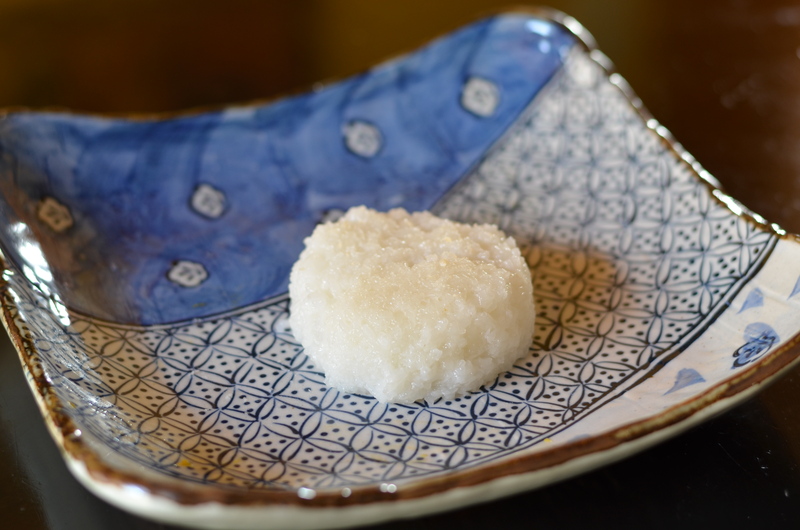 Soak the 2 cups of rice for at least 4 hours, but preferably overnight. The longer it’s soaked, the stickier it will be. While the rice is cooking, begin preparing the custard. In a small pot, combine the light coconut milk, organic sugar, vanilla extract, and salt. Simmer on low heat. Let it cool and chill. 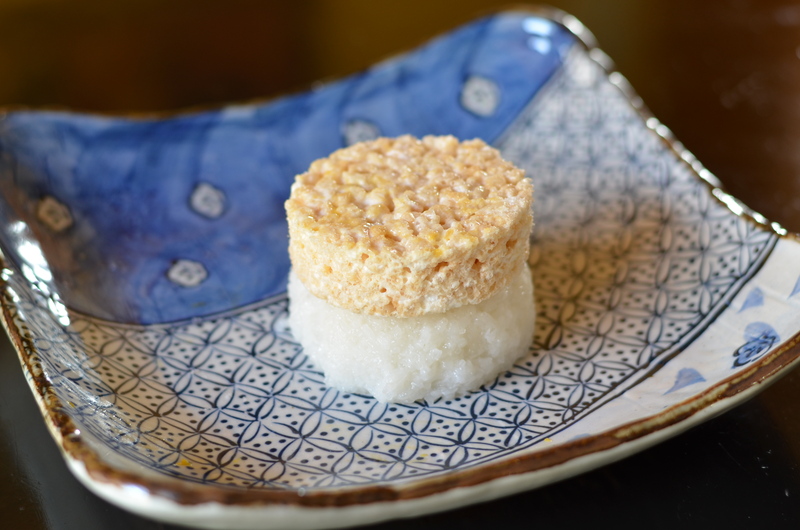 Slice the crisped rice treat in about ¾ inch thickness, then cut with a round cutter (depending on the size you want). Melt marshmallows and butter. Add rice until coated. Spray sheet tray, and spread mixture evenly.